Two thousand and seven was a good year for the Club. Welcome to a new year at Rochfords. I trust you all had a good New Year and ready to go forward with a positive attitude for two thousand and eight. With that thought in mind remember the club's and my own attitude to training. If you work hard in training I will work even harder to get you to your goal. 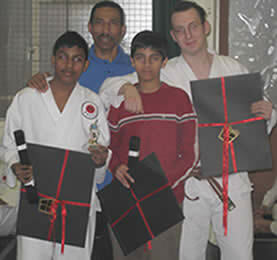 The Club is very fortunate to have a good crop of Brown belts poised to become Black belts (Dan grades) in 2008. 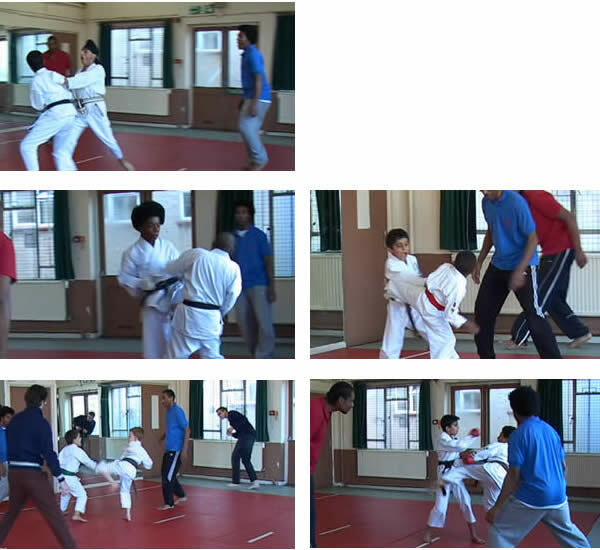 I am sure with lots of determination from the students, focused training from my self, Richard and a comitment from the parents you will all realise your goals in 2008. At the Annual Club competition we all raised �70 for Cancer UK. Thank you to all those parents and friends who donated prizes to be raffled and of course to everyone who bought the tickets that made it all possible. Congratulations and thank you to all students parents and friends who helped to make the day such a success. It is time for our Annual subscriptions. Please note: as of Friday 1st of February 2008, the club lesson fees will have to be paid Monthly. The Children's Party will be held at the club on Sunday 7th December. Please note the date and time will be confirmed later in the year. The Annual Club Competition will be held at the club on Sunday 14 December. The club will close for a Christmas Break on Wednesday 17th December. The club will reopen on Sunday 6 January 2009. The club will close for a summer breaks from Monday 11th of August to Monday 27th August. Training will resume on Wednesday 27th of August. This being the 25th Anniversary of Rochfords gave me an opportunity to thank some of the Dan Grades who over many years have stayed loyal and supportive to Rochfords. 'Dedication to RSKC' trophies were awarded to the following students. Atchyut Sekhar, Andrew Mcgilley, Jovan Bhandal, Gagandeep Talewar, Sukhpreet Talewar, Joshua Braich, Vibhu Verma, Aparna Sekhar, Aqeel Gumbs, Piers Mclaren ( Piers was also presented with a replica of the RSKC 'Exceptional Competitive Spirit Award') Dave Lee Shaw Chris Aikens, Sarog Sharma, Rohan Verma, Rishsi Verma Nicolas Lasbistes and Daniel Charles. Richard Bertie was presented with a special 'Recognition for his exceptional Dedication to RSKC'. 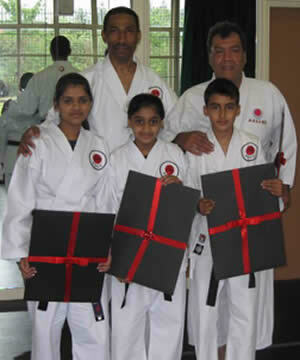 For dedication over nineteen years of training and support. Blondelle and Sharlene Bertie were presented with a bouquet of flowers and a basket of fruit respectively for their years of support both officiating and time keepers and scoring at all our Club Competitions, Sharlene is responsible for nearly all the filming at the clubs Competitions more recently Sharlene has become the Club Physiotherapist. Congratulations go out to all the students who received an achievement trophy, Alliyah Gumbs, Kinnard Lowe, Luke Purser, Joe Wight, Muhtashim Taaseen, Meca-Raheem Muhammad, Waqas Mahmood Shaun Berry, Dillon Howe Zac Sullivan, Charlie Sullivan Solace Lowe Mikael-Musa Muhammad Rohan Bhandal Omar Gumbs, Krtin Kana, Nial Curtis (special mention that Nial was one of the most improved students of 2007), Jay Bhandal Davine, Fongland and Joseph Quigley.